What do fishermen go after? How fishing is effecting the food web structure? _ The food web structure is the feeding connections between organisms within an ecological community, these connections are also known as the food chain. Every living creature is interconnected with other creatures, each rely on a food source that is of another organism; without that other organism as a food source survival would be difficult. In each ecosystem every species has a position; for example to have a functioning community every individual has a job, every position is as important as the other. In human society there is a working class that makes up the largest portion of the human population, than to the middle class that is smaller than the working class than finally the rich which is the smallest class. Each class is important to a functioning human society. __For an ecosystem, the largest group is the producers which can be interpreted to be the base of the food web structure they are also known as the autotrophs (Figure 1). Autotrophs produce their own energy through photosynthesis the use of sunlight to convert into energy. 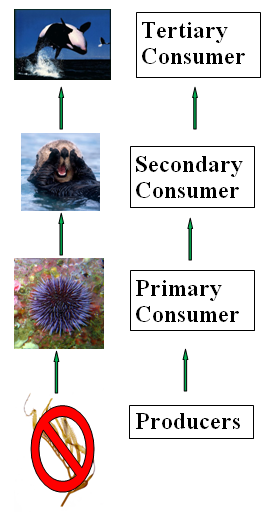 The next group is the consumers also known as the heterotrophs, within the consumers are three groups the primary, secondary, tertiary and so on. Comsumers, or heterotrophs, requires the consumption of another living organism. 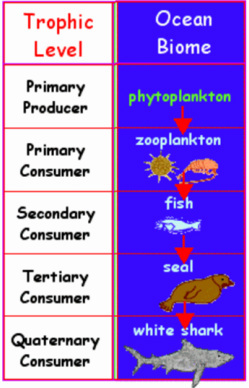 Primary consumers eat producers, can also be called herbivores; zooplankton is a primary consumer to phytoplankton, producers, that uses light and nutrients to create energy (Figure 2). 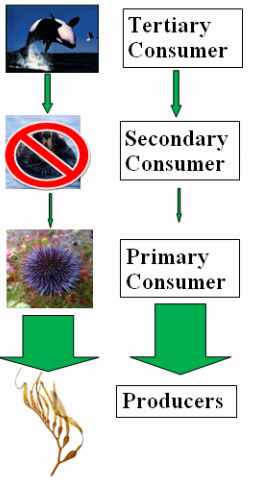 Secondary consumers rely on primary producers as a food source; to continue the chain fish, secondary comsumers, will consume zooplankton, primary consumers (Figure 2). Further along the food chain seals will feed on fish making seals the tertiary consumer feeding the secondary, consumers the fish. Finally on this specific food chain there is a quaternary consumer, also known as the apex predator, the shark, quaternary consumer, preys on seals the tertiary consumer. 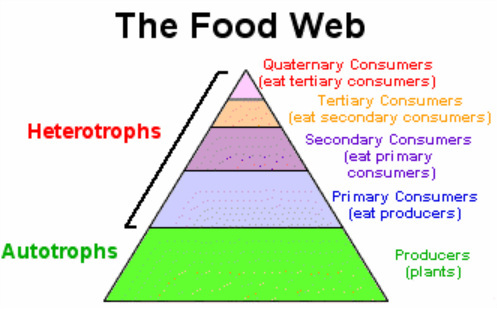 Apex predators can be found at the top of the food web, or in figure 1, the top of the food pyramid. Each organism has a variety of other organisms that it will consume and will consume it. There are multiple links to a single organism, an ecosystem is variable according to situation. Figure 3: For figures 3-6, arrow thickness is relative to population size. For example in figure 3 orca population has increased so the arrow pointing to sea otter is thicker than the arrow pointing from sea otter to sea urchin because orcas have decrease sea otter population. 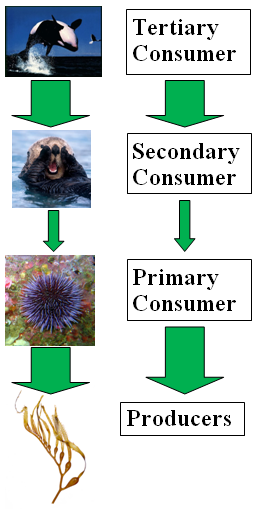 With a decrease in sea otter population there is an increase in sea urchin population so the arrow from sea urchin to kelp is thick (This is the same for figure 4, 5 and 6). _ A top-down cascade is the trophic cascade of the removal of top predators that can be either the quaternary and/or tertiary consumer, can cause shifts and changes in abundance in primary consumers and producers (4). 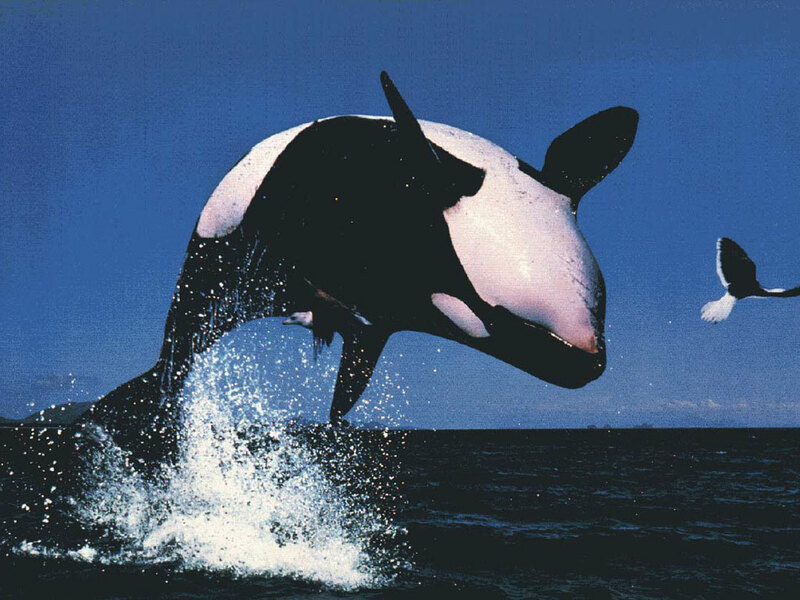 This disrupts the natural order of the trophic cascade; in the orca example if orca population decline greatly than sea otter population increase declining sea urchin populations (Figure 4). But if sea otter population is decrease orca population will also decrease because their food source is dwindle, although sea urchin populations will increase (Figure 5). Figure 4: Top-down cascade; arrow thickness is relative to population abundance. Figure 5:Top-down cascade; arrow thickness is relative to population abundance. _ A bottom-up cascade is the removal of either primary consumer and/or producers. Using the same example, when kelp abundance decreases that limits the food source to sea urchin which will have a decline in their population. 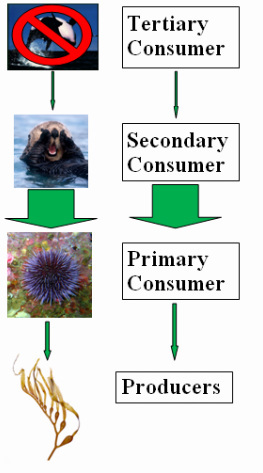 Sea otters depend greatly on sea urchins as a food source, when sea urchin population decrease there will be a decline in sea otter population (Figure 6). This type of trophic cascade of bottom-up affects every member of the food chain community. __ Trophic cascades are important they are a natural population control between species. Anthropogenic additions deviates the natural abundance of species population that many species are seen today as endangered to very rare to finally extinct. How is fishing effecting the food web structure? __ Since the industrial age, commercial fishing has exponentially increased its productivity due because of the growing human population demand for seafood. Fisheries management has failed in controlling the rate of target species capture, “the global marine fish catch is approaching its upper limit” . With a continual demand increasing year to year overharvesting fish stocks had lead to collapses in many fisheries and close to collapse in other fisheries . The vase removal of many individual fish from various target species has lead to many impacts of the abundance and a shift the food web structure. Fishing has also altered the physical properties of target species; commercial fishing not only targets a specific species but also the larger individuals within that species . Economically the larger individuals will have more financial compensation rather than the small individuals. This technique of fishing out the larger individuals has lead to a decrease in the mean size of target fish species. This largely affects the species survival within the marine ecosystem, decrease their ability to protect and defend themselves. Management policy makers need to take into account various aspects of the food web to create the least impacting management plan by consulting researchers that study ways fishing is impacting the food web structure. Studies look at ways fishing is impacting the food web structure by studying the trophic interactions; there are many species that feed on multiple trophic levels that makes assigning specific trophic levels difficult. Also at different development stages of fish, trophic levels will change. Juvenile fish are limited to feeding on smaller organisms so juvenile fish will compete with lower trophic levels but as an adults their once competitor become their prey . Impacts of fishing on the food web structure are the changes in abundance of predators can affect prey abundance . The strength of trophic interactions is important, because dramatically decreasing a predator or prey population can have cascading affects. (Figure 4, 5 and 6 are examples of changes in abundance in predator and prey species) Removal of either prey or predator species can shift the food web; fishing a predator species decreases the predation on a prey species. Let’s call that prey species one; an increase of prey species one’s population will increase pressures on their prey species, which will be called prey species two. Prey species one will be a primary consumer species and prey species two will be a producer species. Increase pressure on prey species two, a plant species that create habitat for the ecosystem, decrease abundance will dramatically alter the structure of the environment that multiple species rely on for shelter (8). Another shift is the fishing of a prey species, predator species that rely on that prey species now have a reduce population to feed on. The decline of prey species cannot sustain the predator species so to compensate the predator species must shift to another prey species. This shift increase pressures on another prey species because there may be another predator species that prey on them, there are now multiple predator species preying on one prey species. This will result in a drop in the prey species that will be unable to sustain both predator species, so there will be a decrease in all prey and predator species (9). _ In the California Current seabird rely on juvenile rockfish (Sebates spp.) as a food source especially during the breeding season. Seabird breeding success is related to the abundance of juvenile rockfish, fishing adult rockfish is affecting seabird productivity. Seabird productivity is determined by the number of chicks that are produced from a mating pair of adult seabirds. This study was conducted in Southeast Farallon Island near San Francisco, California (Figure 8). Rockfish are long-lived with late sexual mature age, commercially fishing has removed adult rockfish before they reach sexual maturity resulting in a lower abundance of juvenile rockfish. Seabird productivity, abundance and distribution are sensitive to changes in prey resources. Most seabird species are long lived with a low rate of reproduction, fishing takes away advantages of ideal conditions for seabird reproduction that can have a long term population effects. Low abundance of juvenile rockfish increase the amount of time eggs and chicks are unprotected increasing vulnerability to predation because parents need to spend more time searching for food. Overall results show that increase fishing has lead to decrease seabird productivity leading to a long term decline in seabird populations (Figure 9). This is an example of bottom-up cascade, a prey species abundance is low affecting a predator species productivity. Figure 9: The relationship between juvenile rockfish abundance and seabird productivity. Decrease seabird productivity is due to juvenile rokfish abundance. As juvenile rockfish abundance increase as well as seabird productivity. _ A study by Meyer et al. 2007 study the abundance of 11 great sharks that prey on elasmobranchs (rays, skates and small sharks), there has been a steady decrease in the great shark species for decades and an increase in the elasmobranchs species in coastal northwest Atlantic (Figure 7). Fishing is the source of the decline in the great shark species, the removal of these apex predators has created a top-down cascade effect. The increase abundance of the cownose ray that preys on bay scallops (Argopectan irradians), soft-shell clams (Mya arenaria), hard clams (Mercenaria mercanaria) and oysters (Crassostrea virginica) has lead to the collapse of scallop fisheries and created competition with humans for food. Also inhibiting the recovery of hard clams, soft-shell clams and oysters; increase predation from elasmobranchs plus humans increase pressure on primary consumer species that are unable to recover. This decrease of apex predator has cascading effects on lower trophic levels. Also the eastern seaboard’s longest continuous shark-target survey (UNC) showed mean length of a few great shark species has decline by 17-47%; overexploitation has left few mature individuals in the populations. There is an increase in juvenile hammerhead populations because the lost of the apex predators that prey on juvenile hammerheads. This study has showed the lost of apex predators can shift an ecosystem to an increase abundance of elasmobranchs. It is predicted that the decrease of scallops and bivalves will alter the structure in seagrass habitat, which is already highly degraded from anthropogenic affects. This alternation of the food web structure can be expected in other ecosystems that have their apex predators removed, a top-down cascade. 5. Field JC, MacCall AD, Bradley RW and Sydeman WJ (2010) Estimating the impacts of fishing on dependent predators: a case study in the California Current. Ecological Applications 20:2223-2236. 7. Jackson JBC and Sala E (2001) Unnatural Oceans. Marine Science 65:273-281. 9. Kaider MJ and Jennings S 2004. Ecosystem Effects of Fishing. IN: Hart PJB and Reynolds JD (ed) Handbook of Fish Biology and Fisheries: volume 2, Fisheries. Blackwell Publishing. Malden, MA. Pp 342-366. 11. Polunini NVC and Pinnegar JK 2004. Trophic Ecology and the Structure of Marine Food Webs. IN: Hart PJB and Reynolds JD (ed) Handbook of Fish Biology and Fisheries: Volume 1, Fish Biology. Blackwell Publishing. Malden, MA. Pp 301-320. 8. Field JC, MacCall AD, Bradley RW and Sydeman WJ (2010) Estimating the impacts of fishing on dependent predators: a case study in the California Current. Ecological Applications 20:2223-2236. 9. Field JC, MacCall AD, Bradley RW and Sydeman WJ (2010) Estimating the impacts of fishing on dependent predators: a case study in the California Current. Ecological Applications 20:2223-2236.
http://www.youtube.com/watch?v=v_aSl3iL7rM PBS “Jean-Michel Cousteau: Ocean Adventures, Kelp Forest, PBS.” Youtube. 20 May 2008. Web. 4 December 2011.